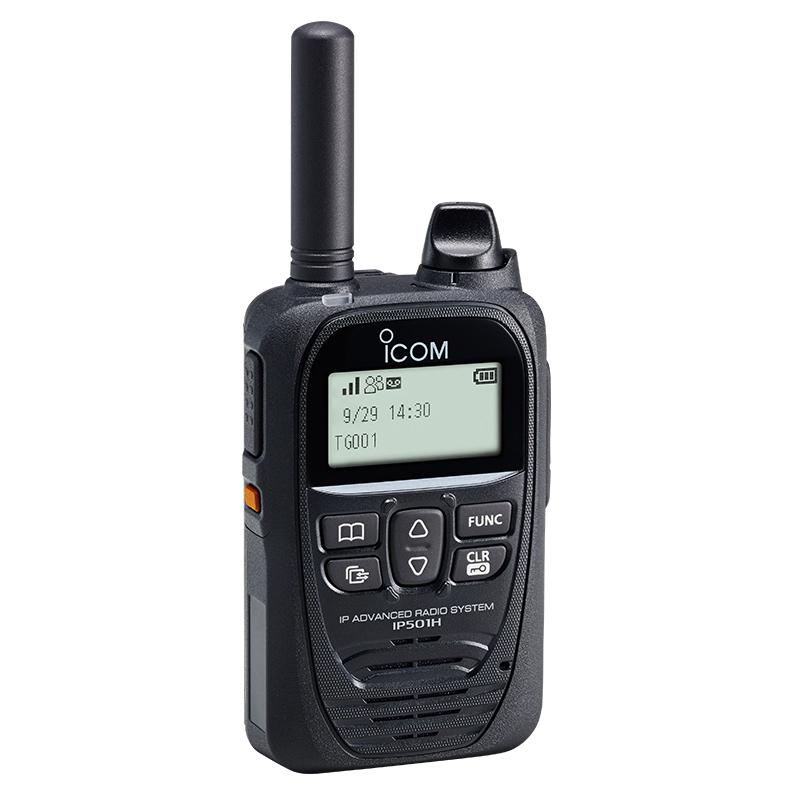 The new IP501H LTE from Icom provides users with the unique experience of having telephone-style communication but without the restrictions that come with cell phones such as dropped calls under poor coverage, or environmental factors such as water or dust that could damage the phone. The radio operates on an LTE (4G) and 3G network to give you superior wide area coverage, with the ease of push-to-talk communications. So, whether you’re at the front desk of a hotel, or on the construction site, you can count on the IP501H to keep you connected. The IP501H operates with full-duplex communication, allowing users to talk and receive messages at the same time, similar to a telephone. This feature provides users with instantaneous and smooth communications, which is ideal for those using the radio during emergency situations or working in dangerous environments. The radio’s IP67 waterproof rating and military specs mean the radio can withstand drops from 122cm, extreme temperatures from -57°c to 80°c, dust resistance for wind speeds up to 14 km/s, and waterproofing for submersion in up to 1m depth of water for 30 minutes. No matter where you are, or what environment you’re in, you can count on the radio to keep working when the outside environment gets rough. With the IP501H, there’s no need to wait for channels to become available to place a call. With its Multiple User Communication functions, users in the call groups can place calls instantaneously, reducing wait time. This radio also features Priority Interrupt Calling that allows users to be placed in group calls with three or more people. Not only does Priority Interrupt Calling support group calls, but if you find yourself in an emergency situation needing to relay an important message to a user in an on-going call, you can break into that call to transmit your message. When timing is everything, especially for those facing emergency situations who have no time to wait to transmit a message, these features will be the first thing you’ll be using to connect with your team. These three top features of the full-duplex IP501H are just scratching the surface of the radio’s capabilities. This compact and lightweight radio is comfortable to carry around no matter what industry you’re in. Not to mention, it has high-quality audio, emergency button, and Lone Worker and Man Down features, as well as built-in Bluetooth® and GPS. To learn more about the Icom IP501H LTE Radio and other Icom products to elevate your business, contact Nova today. Please note this radio is expected to begin shipping from ICOM this month and will be up on our webstore shortly. I am curious about pricing IP501H LTE. Can you let me know about more details. Thank you for your inquiry, one of our representatives will be in touch via the email provided with the information you seek. Last spring we purchased a pair of motorola SL300’s fro. Bobby Forest al, and we have been delighted with their performance. We are interested in the new Icom Lte. What kind do range do these radios have and do they need a cell phone plan to operate? What is the price for a new pair? Glad you are enjoying the radios you purchased from us, I have sent your question over to Bobby. He will provide you with the information you need.